Yes, Renée Zellweger Looks Different, so What? 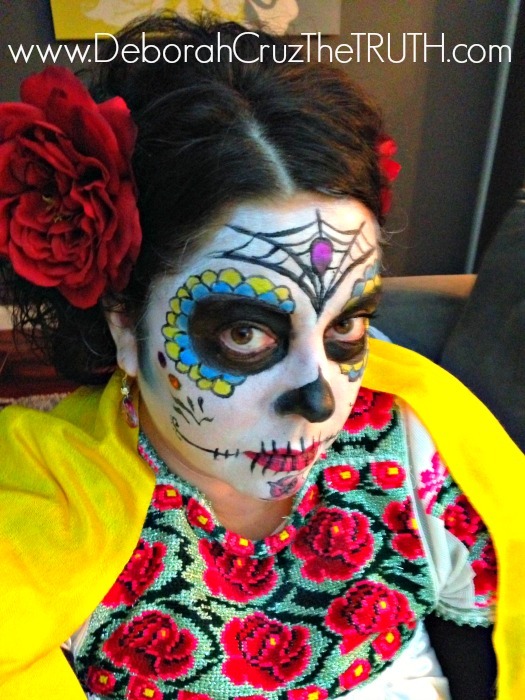 Halloween and Dia de Los Muertos are only a few days away. Last weekend was our city’s annual Fright Night and Zombie walk. My daughters have been wanting to participate for the past 3 years but we’ve felt they were too young to be immersed in the middle of all of those “zombies” so we’ve been watching from the sidelines. This year, we decided would be the year that we all walked “amongst the dead”. They were zombies and I was la Calavera Catrina, recognized as a sugar skull. My husband and girls dressed as authentic walking dead zombies. My husband was a typical zombie ironically wearing a blood smeared “Be Kind to the Earth” t-shirt with a vintage plaid flannel. I guess he was going for hipster zombie look. My 9-year-old was a prom queen zombie. Luckily her ballet rehearsal was done in just enough time to get home, change into her “prom” dress and dead face. My littlest one was the cutest dead school girl ever. My little brother and I chose to go in a different direction. I love the Walking Dead but I just can’t make myself drag my legs and growl at people so my brother dressed as a sugar skull and I dressed as the Grand Dame of Dia De Los Muertos, la Calavera Catrina. The best part? Everything I needed was in my closet. 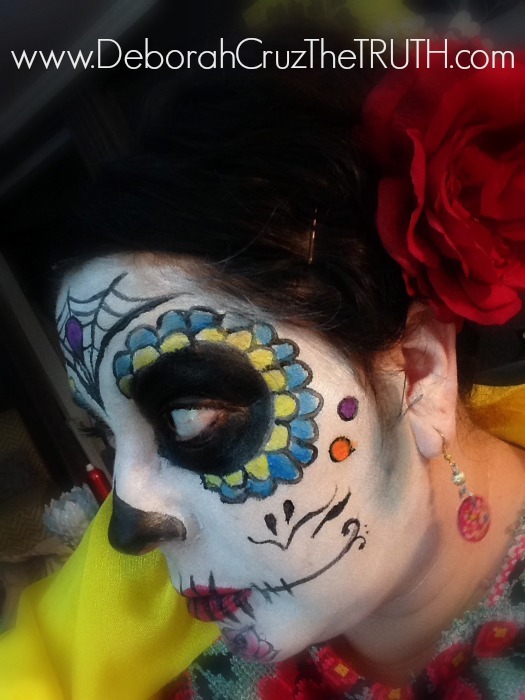 Here is how to apply the Dia de Los Muertos make-up and pull together a costume that will make heads turn. I think it turned out awesome! Begin with an even layer of the Ben Nye Clown White make-up all over the entire face, except the eye sockets, with a sponge, and set with powder. You can buy setting powder at the Halloween shop but, honestly, baby powder works just as well. It is important to set the color with the powder, because the black lines and color on top may get smudged unless you place a barrier in between. Seriously, your face will look like it is melting off if you don’t and who wants to go through all that time painstakingly applying make-up only to have it slide right off your face? Next, I sculpted the perimeter of my eye socket with a black liquid eyeliner, it’s much easier to use than regular black face make-up and it lets you be more precise with your lines. Then intensify the area by blending a matte black shadow in the same hue over the top of the entire eyelid and filling in the drawn socket. For the detailing, pick up a black liquid liner with a precise tip, and draw an upside-down heart on the nose, the two rows of scalloping, connected by a circular motion, that surrounds the eyes and the two small circles on either side of my cheek bones. Mark out seven lines in a V-shape on your forehead. I made a jewel in the middle of mine, you can too or not, whatever you choose. Connect the lines with curved shapes to create a spider web. Use the same liquid liner to draw the two lines on your cheeks and draw a rose on your chin. Use a color wheel of your choice to fill in the scalloping around your eyes, your jewel and any other designs on your face that need color. I set the color with more translucent powder, not too much, just enough to keep the color from running. Moving on to the lips, I wanted red lips so I used my Red Chanel lipstick to draw in my lips. Then with the black liquid eyeliner, I drew in the intersecting lines across my lips. I let all lines dry well and then went over with liquid eyeliner again. With the liquid liner, add a few dotted details over the face, and a flower on your chin. Touch up individual areas with the color palette of your choice as needed, and after a few coats of mascara, I used fake-eyelashes to give my eyes a little extra umph. For the hair, I simply washed my hair and dried it curly. Teased it. Pulled it to a curly, side pony tail and then added two oversized red roses behind my ears, which I held in with bobby pins. You could also opt for a headband with flowers on it. To finish the look, I shopped my closet. Sometimes being a Latina with a dad who retires to Mexico 8 months a year has its advantages. I wore a long black skirt, a white peasant blouse with red, yellow and green roses from Mexico as my blouse, an ornate, traditional Kelly green velvet apron with gold scalloping and bright gold shawl. It came together perfectly but, honestly, the make-up makes the costume.